Today, November 29, marks the International Day of Solidarity with the Palestinian People, the day in which the United Nations passed the Partition Resolution in 1947. The Partition Resolution is the biggest stab to the Palestinian people, because it robbed them of a large part of their land, taking it from its original owners and giving it to alien Jewish settlers who came from various parts of the world. In response to this United Nations resolution, governments and civil society conduct various activities annually to mark the International Day of Solidarity with the Palestinian People. On this day in 1947, the United Nations General Assembly passed Resolution 181, later known as the Partition Plan, which stipulated that a Jewish and a Palestinian Arab State would be established in Palestine. 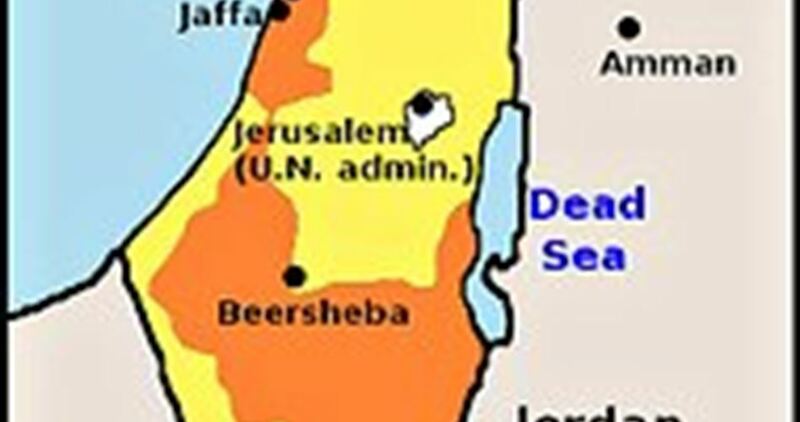 Only a Jewish State, Israel, was established, while the Palestinian state remained ink on paper for up till now. The International Day of Solidarity with the Palestinian People is an opportunity to remind the world and its forces of the reality of the Palestinian tragedy and the injustice inflicted upon the people of Palestine as a result of the Partition Resolution. This is also an occasion to remind the international community of the fact that the question of Palestine has not yet been resolved despite all the efforts, endeavors, initiatives, negotiations, visits and exploratory tours of the Middle East undertaken by hundreds of officials and delegations from foreign countries. It is worth mentioning that the Palestinian people, whose number had surpassed twelve million, have not yet attained their inalienable rights as established by the General Assembly, namely the right to self-determination without external interference, the right to national independence and sovereignty, the right of the Palestinian refugees to return to their homes and property, from which they have been forcibly removed. Israel’s greed was not limited to the articles of Resolution 181. In 1948, when the war broke out between Israel and the neighboring Arab states, the Jewish state expanded and captured 77 percent of the territory of Palestine, including a large part of Jerusalem. There have been many Arab-Israeli negotiations in Madrid, Geneva, Oslo, Washington, Camp David and many others, but they have shown one fact that Israel does not want a real peace, and that all it wants is negotiations for the sake of negotiations. The Islamic Resistance Movement (Hamas) asserted in a statement on the anniversary that the Partition Resolution 181 is unjust and void because it establishes and legitimizes the occupation of the lands of others by force in a flagrant violation of the most basic principles of justice, the rules of international law, and the legal and moral foundations on which the United Nations was established. A horde of extremist Jewish settlers at dawn Sunday sabotaged the tires of some 30 Palestinian vehicles in the central Israeli-controlled Arab town of Kafr Qasim and spray-painted threats and slurs on property. The Israeli police claimed they launched an investigation into the incident. On Friday, the police said they were investigating the vandalism of a building and vehicles in a Palestinian village near Bethlehem. 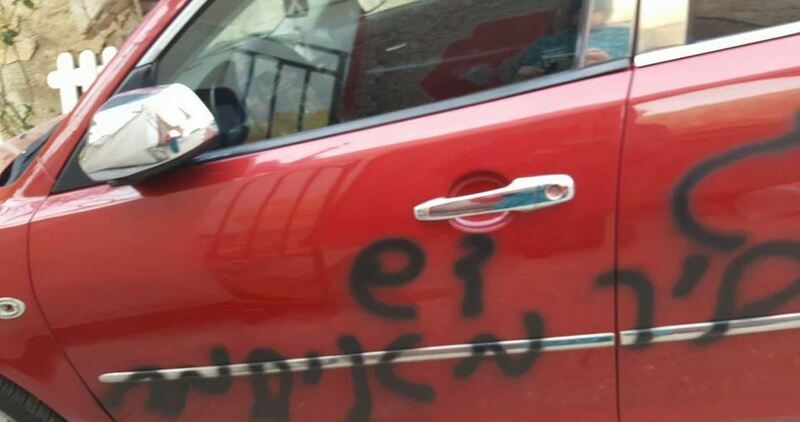 Residents of the West Bank village of Jab’a, southwest of Bethlehem, said they discovered Hebrew graffiti spray-painted on homes and cars in the morning, and the tires of nine vehicles had been punctured. The graffiti included Stars of David and the words “Bat Ayin evacuation — revenge.” The previous day, the Israeli authorities had demolished an illegally constructed toilet facility near a synagogue in the nearby settlement of Bat Ayin. Last Sunday, a number of vehicles were damaged and graffiti was spray-painted on walls and cars in the Palestinian village of al-Mughayir in the central West Bank. Last month, Aisha Rabi, a Palestinian mother of eight, was killed when a big rock, thrown by a settler, flew through the windshield of the car her husband was driving and struck her head. Such settlers’ attacks have increased in frequency in recent months. However, Israeli law enforcement authorities exhibit extreme incompetence in addressing such widespread occurrence of settlers’ crimes. The vast majority of investigation files regarding harm to Palestinians and their property are closed due to deliberate police failure to investigate properly. The deficiencies and flaws in the work of the Israeli police are clearly noticed at every stage of an investigation when the victim is a Palestinian citizen. 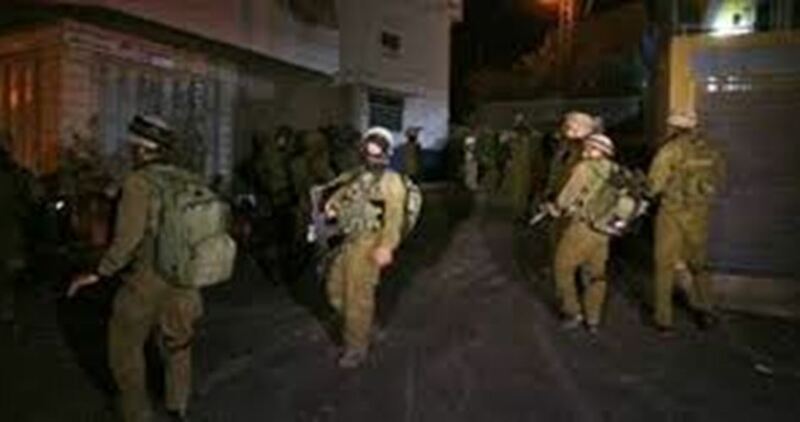 The Israeli occupation forces at dawn Sunday kidnapped three Palestinians, including a child, during West Bank sweeps. 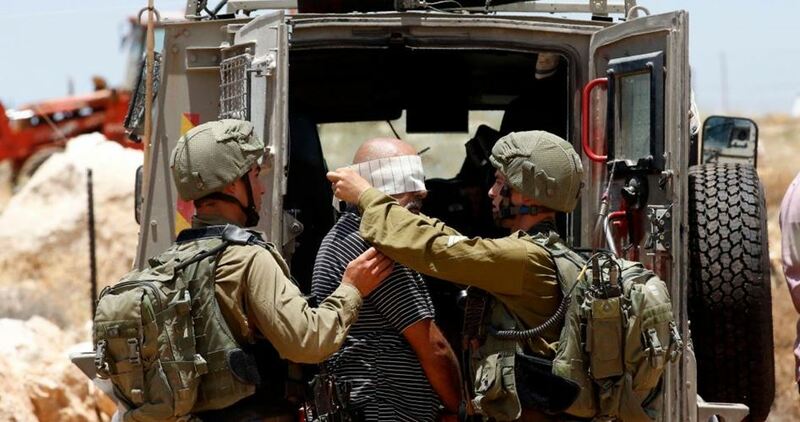 The Palestinian Prisoner Society said that the Israeli forces arrested Anas Omar, 22, in Tulkarem, Ahmad Ghaith, 15, in al-Khalil, and Ahmad al-Mashni in Bethlehem. The Prisoner Society pointed out that the Israeli forces over the past two days have arrested 10 Palestinian citizens, including the ex-prisoner Malak al-Khatib. The Israeli occupation forces (IOF) at dawn Sunday stormed Khilat al-Amoud neighborhood in Nablus city and posted themselves on Attour Mount, which overlooks the Old City. 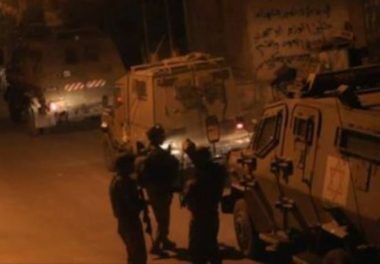 Local sources told the Palestinian Information Center (PIC) that troops aboard five patrol vehicles and one detention van entered the neighborhood at dawn and remained there until the morning, without making arrests. During the past two weeks, the same neighborhood had seen raids on homes and detention of several young men. The Israeli occupation forces (IOF) on Sunday violently quelled a peaceful demonstration in solidarity with Jerusalem at Huwara checkpoint, north of Nablus city. Eyewitnesses said that the IOF heavily fired teargas canisters and rubber-coated metal bullets at the demonstrators. 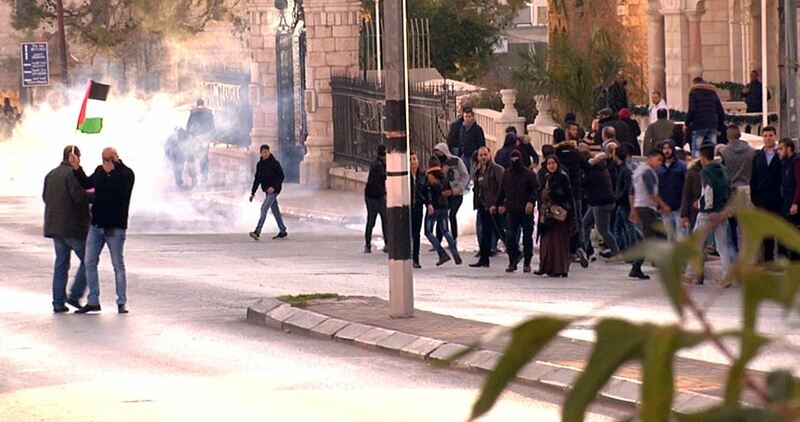 A number of Palestinians suffered breathing difficulties as a result of inhaling teargas. The witnesses noted that large military reinforcements were summoned in the area, while Israeli drones kept hovering in the sky. The demonstration was organized by several Palestinian groups in Nablus to express solidarity with Jerusalem which is being subjected to systematic violations and aggressions. Palestinians have aborted US attempts to exclude Palestine from the Organisation for the Prohibition of Chemical Weapons (OPCW), the foreign minister said Saturday. Riyad al-Malki said the Palestinian delegation to the OPCW’s Fourth Review Conference has rejected “US attempts to add an article in the final document to cast doubts on the membership of Palestine” in the watchdog. “Most member states have defended Palestine’s right to equal representation with other states,” he added in a statement. Palestine officially joined the world’s chemical weapons watchdog in June. The top Palestinian diplomat went on to vow to pursue efforts to bring Israel to accountability for using chemical weapons against the Palestinians. OPCW member nations have failed to agree on a final document at the conference, which was held in The Hague on November 21-30. The OPCW, an international chemical weapons watchdog, has been servicing as the implementing body for the Chemical Weapons Convention since its entry into force in 1997. Israeli soldiers abducted, on Sunday at dawn, a Palestinians child in Hebron, in the southern West Bank city of Hebron, and installed many roadblocks near towns around the city, before stopping and searching dozens of cars. Media sources in Hebron said the soldiers stormed and searched a number of homes, and abducted a child, identified as Ahmad Shaher Gheith, 15, in the southern area of the city. They added that the soldiers installed roadblocks at Abu al-Halawa junction, in the southern area of Hebron city, in addition to the southern entrance of Bani Neim town, and the northern area of Yatta town, before stopping and searching dozens of cars. The soldiers interrogated many Palestinians while inspecting their ID cards, causing huge traffic jams in the entire area. 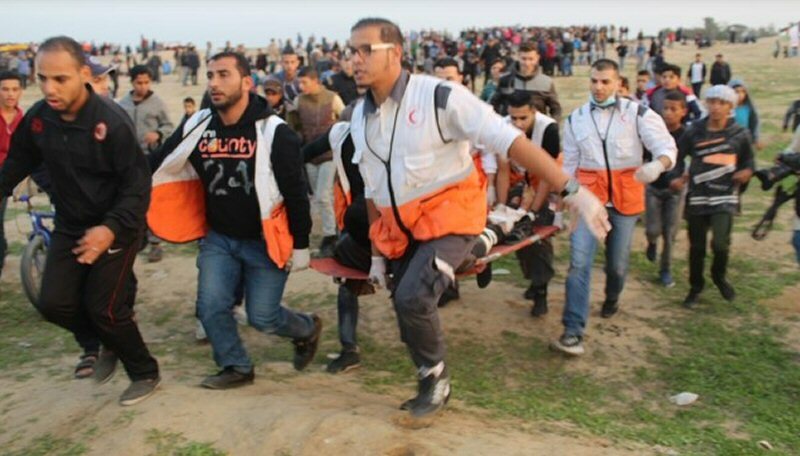 On Friday evening, 30 November 2018, Israeli forces wounded 58 Palestinian civilians, including 14 children and a paramedic in the peaceful demonstrations in the eastern Gaza Strip despite the decreasing intensity of the demonstrations there for the fifth week consecutively and absence of most means usually used during the demonstrations since the beginning of the Return and Breaking the Siege March 7 months ago. According to observations by PCHR’s fieldworkers, for the fifth week since the beginning of the Return March on 30 March 2018, the demonstrators abstained from setting fire to tires while the attempts to cross the border fence and throw stones and incendiary balloons were completely absent. At approximately 14:30, thousands of civilians, including women, children and entire families, started swarming to the five encampments established by the Supreme National Authority of Great March of Return and Breaking the Siege adjacent to the border fence with Israel in eastern Gaza Strip cities and raised flags, chanted national songs in addition to organizing sportive and folklore performances inside the encampments and its yards. Hundreds, including children and women, approached the border fence with Israel in front of each encampment and gathered tens of meters away from the main border fence. Further, setting fire to tires, throwing stones, incendiary balloons and Molotov cocktails were almost absent. Despite the prevailing calmness, the Israeli forces fired live and rubber bullets in addition to hundreds of teargas canisters, particualry in eastern Jabalia, Gaza and al-Bureij refugee camp. The Israeli shooting, which continued at around 17:00, resulted in the injury of 58 Palestinian civilians, including 14 child and a paramedic. Doctors classified 4 civilians’ injury as serious. In addition, hundreds suffered tear gas inhalation and seizures due to tear gas canisters that were fired by the Israeli forces from the military jeeps and riffles in the eastern Gaza Strip. Israeli forces, on Saturday, quelled a peaceful demonstration on al-Zahra St, in central occupied Jerusalem, that was held in support of wounded Palestinian detainee Israa Jaabis. Jaabis, 33, a mother of a baby child and a resident of Jabal al-Mukkaber neighborhood of occupied East Jerusalem, was sentenced to eleven years in jail after she was charged of attempting to blow up an Israeli army checkpoint outside of Jerusalem, in October of 2015. WAFA correspondence said that Israeli police and special forces attacked dozens of Palestinian protesters, who were demanding the release of Jaabis, with tear gas canisters and stun grenades. No injuries or arrests were reported. Jaabis, who is married to a Palestinian from Jericho, had a gas cylinder in her car when it blew up, apparently accidentally, when she was only meters away from the checkpoint to the east of Jerusalem. Her family said that, at the time, she was moving her belongings from Jericho to a new place in Jerusalem, and the cylinder blew up by accident. The army, however, decided otherwise and said Jaabis was intending to blow up the checkpoint. The Jerusalem resident was seriously hurt in the accident, and left with third degrees burns on 60 percent of her body and face. She also lost eight fingers. 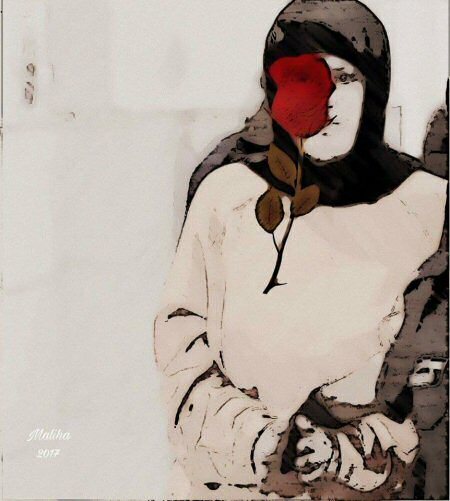 Jaabis’ medical condition has worsened severely, since her arrest, due to medical negligence by the Israeli Prison Service (IPS).